An evacuation plan is a necessity for every home, especially if you live in an area where fires, earthquakes, hurricanes, flooding, and other disasters are a possibility. Many homeowners create evacuation plans for their homes and practice them with their kids, but far fewer have considered one for their pets. Take these steps to add your pets to your evacuation plan. Assign pet evacuation to an adult. Everyone should know how to act during an evacuation, and that includes assigning one parent or adult to the pets. This allows the other parent and the children to focus on their part of the evacuation plan, so there’s no confusion during a high-stress moment when time is of the essence. Keep evacuation maps and pet carriers readily accessible. If you need to evacuate, you should know exactly where every important item is. If you pets require carriers, keep them in a place that you can access easily. Practice your plan. Include your pets in your home evacuation drills. It’ll help you see how they will respond and make changes to your plan if necessary. Getting your dog out of a window may not be as simple as you think! Be prepared in case you get separated from your pets. No matter how much you drill your evacuation plan, it’s possible that a dog or cat will run off while you’re focusing on keeping your family safe. A microchip or a GPS-compatible tag can help you find your pets once it’s safe to return to the area. Hunting for a new home online is a great place to start your search, but it should not be your end all be all. Good listing agents are excellent at highlighting the best features of the home, but keep in mind there may be more than meets the eye. To make the most of your time and efforts and gather a well-rounded picture of home listings online, keep the following three things in mind. Stay up to date. When you start your search, make sure you find a site that pulls up-to-date listings directly from the multiple listing service (MLS) where real estate agents actively post their most current homes for sale. Many online resources update less often or fail to remove listings that are off the market, making it more difficult to sort through the clutter. Pictures can be deceiving. Real estate photographers are experts at showing a home in the best possible light. Many use tools and strategies to boost appeal, such as a fisheye lens to make areas look larger and creative editing to make colors and textures really pop. But, often listings will not contain photos of unappealing parts of the home, like small closets or outdated bathrooms. See it to believe it. Once you find what appears to be your dream home online, call up your real estate agent and schedule a showing. You want to take the opportunity to vet the home in person and explore every part of it before beginning the offer process. Your real estate agent will help you cover all your bases and will ask questions you may not have thought of. One of the better sites out there to search for homes is Realtor Rod’s #vylla site. Visit me at vyllaaz.com and search the MLS. What you’re ready to “see it to believe it”, give me a shout and I can set that up! Opendoor.com is making a clear play on people in a financial pickle, or who don’t know enough to understand the numbers. Give em credit, it’s brilliant, but it’s terrible in the same breath. Here is an explanation of Opendoor’s business model and look at some of the numbers when selling your home with them. It all started when I noticed a home in my area selling for 447k via Opendoor. I remembered this property had been previously sitting on the market for a while and I walked through it during an open house. After a little research, I found it was purchased by Opendoor only a few weeks previous for 367k. Little to no rehab to the property was done by Opendoor before it was put back on the market for a whopping 447k. So how did it magically gain nearly 80k in value within 3-4 weeks? I decided to dig into the Opendoor.com experience and find out. When Opendoor quotes your home you will notice a few interesting item lines. 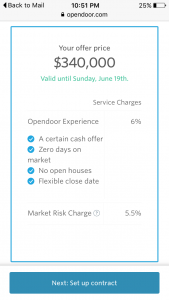 Opendoor Experience 6% and Market Risk Charge5.5% (which they say could be 0-6% based on conditions). In this example Opendoor offered 5.5% because they are fishing for dummies like a used car salesman. But I bet in very few cases this goes under 3%. This is a huge red flag from the jump. Opendoor is essentially cutting out two real estate agents, but then charging a 6%Opendoor Experience Fee. FYI: 6% would cover both the buyer and seller’s real estate agent costs in most US home transactions. In addition Opendoor is charging a 5.5% Market Risk Fee in case the market crashes. Where in the world does any consumer get a market risk guarantee on any major asset purchase? This is the red flag folks. This is fireworks. This is the part when your brain say…Ripoff! So let’s play out a scenario and say Opendoor buys your house for 400k. Their offer will ALWAYS be a low ball offer, bet on that. These guys are buying and selling (flipping), so they can’t afford to pay market price. What is one of the rules of flipping? Find profit. We’ve all watched Flip or Flop on HGTV once or twice, so you think we would know the game. Here are a look at the difference in the numbers based on a sample quote. If Opendoor is willing to buy your home for 400k, you best believe you can sell it for at least that price. Because they still have to turn a profit on a 400k purchase. And the fees you are paying would usually be profit in the home seller’s pocket. Therefore in this scenario you need to ask yourself, am I willing to give up at minimum an additional $22,000 on the sale of my home for the convenience of not using real estate agents? Also consider you are most likely going to take a low ball offer. My guess is that a home that would sell for at least $425k would be purchased by Opendoor for about $400k. So in our example above you are giving up $23,500 ADDITIONAL off the top with the 6% of real estate agents factored in. After you sell to Opendoor, best believe your home will go up for sale in 2-4 weeks. And its price tag will make you want to open your door and run into oncoming traffic. Your moving out of state and you feel that paying the Market Risk Fee is worth the time saved. You have terrible neighbors or the house doesn’t show well and Opendoor doesn’t have a clue. Your home is a lemon and you want to try and dump it on someone. You bought another home and can’t sell your current home and it’s becoming a financial burden. You can’t sell your home and the time invested is not worth it anymore. You would pay a lot to skip the home selling process. The sale of the home in a specific year will off set your taxes enough to make the loss worth it. What does Opendoor.com do to the housing market in Phoenix in my opinion? It over inflates homes, because we have a company purchasing them in bulk and jacking up the price. On top of that they are padding their sale via impatient consumers with a Market Risk Fee. That means they can sit on them longer. What happens if they become a major player in neighborhoods and can start to swing the prices of homes because they own a large percentage of them? They have the capital to do it. Opendoor has a ton of capital raised because investors know it’s a winner. It’s a large corporation trying own the homes that were once owned by people. Essentially a hedge fund for housing. Housing is changing from a place to reside into something a corporation is using for maximize profits. This beyond a terrible idea for the average home owner. My advice: Don’t sell or buy from this company because they are nothing more than a “We Buy Homes For Cash” sign with a pretty website. Ask me about our discount listing fees. I will get your home sold and more money in your pocket! Lowball offers: Going far below market value when you make an offer damages your credibility as a buyer and can be insulting to the seller. The seller has a range in mind that they’ll accept, and if you’re not even approaching the low end of that range, they won’t even consider the offer. Incremental negotiations: Don’t continue to go back to the seller with small increases in your offer ($1,000 or less). The constant back-and-forth can grow tiresome and lead the seller to consider other opportunities. “Take it or leave it”: Try not to draw a line in the sand with your initial offer. The seller can get defensive and consider other offers if you immediately show that you’re unwilling to budge. Even if it’s true, don’t make a show of it. Nitpicking after inspection: Obviously if inspection reveals a major issue, it should be factored into the final sale price. But insisting on a lower price for every minor repair can put negotiations in a stalemate. Asking for more, more, more: Some buyers will request that the sellers throw in add-ons like furniture or appliances that weren’t included in the listing. Try to avoid giving the seller a reason to build up resentment and think that you’re being greedy. Most of us NYC’er are born negotiators. Its in our nature! 🙂 That translates into more money in your pocket as a seller and less money out as a buyer. Trust us, we are skilled negotiators can usually find some common ground. Thinking of buying or selling? Let me work for you!